The large 3-D metal church replica looked impressive and realistic, but upon closer inspection, you realize it is constructed of guns, bullets and buck shot. Minerettes made of pistols and riffle steeples. I was amazed by the attention details, craftsmanship and artistry of the few pieces I saw on display at a small exhibit of his work at a gallery in Washington, D.C. 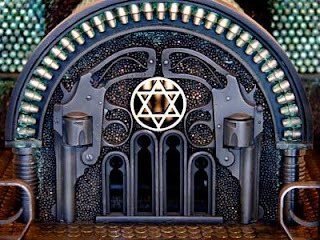 The self-taught California Artist Al Farrow created the “Reliquaries” series of religious structures composed of guns, gun parts, bullets, steel, glass and bone. 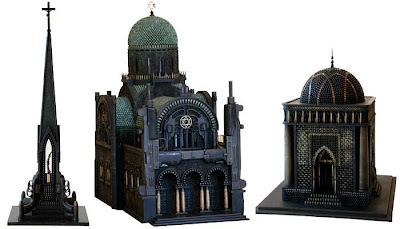 The welded sculptures are commentaries on militarism loaded in the histories of the three major religion structures: Synagogues, mosques and churches. A reliquary, also called a shrine, is a container for relics. These may be the physical remains of saints, such as bones, pieces of clothing or some object associated with saints or other religious figures. Al Farrow wrote about his work, “As early as the fourth century, the cult of sacred relics was an important part of Christian worship. At that time, the church first promulgated the doctrine which stated that the remains of martyrs and objects associated with Christ, the Virgin and other Saints, possessed miraculous powers. In the later middle ages, churches, monasteries and even private individuals accumulated large collections of relics. Pilgrims traveled the length and breadth of the Christian world to visit shrines, churches and crypts where relics were housed. As a theological importance of relics increased, so did the desire to put them into protective "Containers". The "container" or architecture's physical beauty was thought to enhance the spiritual significance of the venerated objects. Thus, in many ways, reliquaries are among the richest and most imaginative of all church treasures. The earliest take on the form of simple boxes or caskets. Later examples may be complex architectural forms, statuettes or shapes resembling the actual relics enshrined. I am not a gun person," the artist said. "My fascination with guns is with their function and use. It is the ubiquitous presence, seeming necessity and actual accessibility of guns in our culture that inspires my investigation. I am interested in their impact on society and cultures: Past, Present (and Future). About his materials Farrow said, “I do not personally use guns (Except as a medium for making art), so I was amazed at the availability of gun related paraphernalia when I started to accumulate supplies for this body of work. I am also perpetually surprised by the historical and continuing partnership of war and religion. The atrocities committed in acts of war absolutely violate every tenet of religion, yet rarely do religious institutions speak against the violations committed in the name of God. Historically, Popes have even offered eternal salvation to those who fought on their behalf (The crusades, etc. ).In my constructed reliquaries, I am playfully employing symbols of war, religion and death in a facade of architectural beauty and harmony. I have allowed my interests in art history, archeology and anthropology to influence the work. The sculptures are an ironic play on the medieval cult of the relic, tomb art, and the seductive nature of objects commissioned and historically employed by those seeking position of power.” See the making of an enormous cathedral replica here. (click through the phases to see the progress). Prices at the exhibit I saw ranged from $9,000 to $85,000. San Francisco’s De Young Museum plans to exhibit Farrow’s work in November, 2008. I recommend checking it out if you are in that area. Do you know of other artists engaged in work the architectural or miniature building themes? I saw this in the paper a while back. I have something for you sort of dealing with this in a few days.